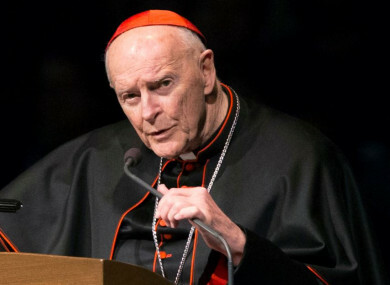 Cardinal Theodore McCarrick pictured in March 2015. THE VATICAN’S RETIRED ambassador to the US has purportedly penned an 11-page letter accusing senior Vatican officials of knowing as early as 2000 that the disgraced former archbishop of Washington, ex-Cardinal Theodore McCarrick, regularly invited seminarians into his bed but they still promoted him to cardinal. The letter, an extraordinary intervention from a one-time Holy See diplomat, also accuses Pope Francis of having initially rehabilitated McCarrick despite being informed of his penchant for young seminarians in 2013, soon after he was elected pope. The National Catholic Register and another conservative site, LifeSiteNews, published the letter attributed to Archbishop Carlo Maria Vigano today as the pope is in Ireland on a two-day visit. Yesterday, Pope Francis met eight survivors of clerical, religious and institutional abuse. Vigano (77) a conservative whose hard-line anti-gay views are well-known, also urged the reformist pope to resign over the issue. Since then, another man has come forward saying McCarrick began molesting him starting when he was 11, and several former seminarians have said McCarrick abused and harassed them when they were in seminary. The accusations have led to a crisis in confidence in the US hierarchy, because it was apparently an open secret that McCarrick regularly invited seminarians to his New Jersey beach house, and into his bed. Vigano, the Vatican’s ambassador to the US from 2011-2016, said his two immediate predecessors “did not fail” to inform the Holy See about accusations against McCarrick, starting in 2000. He said Francis asked him about McCarrick when they met on 23 June 2013, at the Vatican’s Santa Marta hotel where the pope lives, three months after Francis was elected pope. Vigano wrote he was surprised to find that McCarrick started travelling on missions on behalf of the church soon thereafter, including to China. McCarrick was known to have been one of the Vatican’s intermediaries in the US-Cuba talks in 2014. The letter also contains a lengthy diatribe about homosexuals in the Catholic Church. It often reads like an ideological manifesto, naming all of Francis’ known supporters in the US hierarchy as being complicit in a cover-up of McCarrick’s misdeeds. Email “Former Vatican official accuses pope of failing to act on abuse by ex-Cardinal ”. Feedback on “Former Vatican official accuses pope of failing to act on abuse by ex-Cardinal ”.